Some 40 livin, an see ablo. 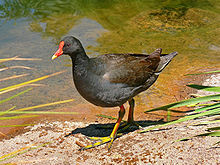 The rails, or Rallidae, are a large cosmopolitan faimily o smaw- tae medium-sized grund-livin birds. This page wis last eeditit on 27 Julie 2016, at 02:32.